Last Wednesday night DB ended up having the night off. Usually he is working at the restaurant on Wednesday so I get a chance to relax, catch up on the DVR, be lazy, and NOT cook. My plan of rummaging in the fridge for something to eat and watching the Real Housewives of NJ was foiled. So I ended up whipping together some Philly Cheese steaks and some Parmesan tossed tater tots. Quick, easy and cheap. One of our food staples is frozen Philly steak meat. I'd never had it before and honestly was a little grossed out by it when BD wanted to buy some. Then a couple of years ago on X-mas Eve he made a couple for us before we went out. I was pretty shocked at how quick and yummy it was. 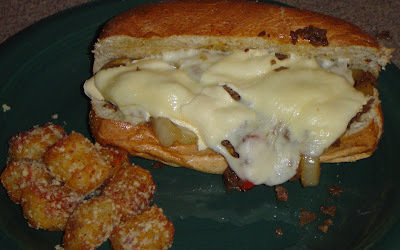 Philly Cheese steaks - A fast and loose recipe! 1- Slice your veggies and saute in a little EVOO or butter till tender. Remove from pan and set aside. 2- *Some brands want the meat thawed and others don't so be sure to check for that. * Throw it in the pan, sprinkle with S&P and garlic to taste. Cook until thoroughly done. 3- Throw veggies back in the pan and toss together. 5- Throw under a broiler until cheese is melty. *This is sooooo easy and makes tater tots even better than they already are. 1- Take tots and place on a sheet pan. 3- Sprinkle salt, pepper, garlic and onion powder to taste. 4- Bake according to package. 5- When done sprinkle with Parmesan cheese and toss to coat. What I like about this meal is that even though its not fancy, hard or takes a lot of time - it still have a homemade quality to it. Plus its great comfort food. While I was at the grocery store picking up a few things I needed for dinner that night I wandered into the bakery. BAD IDEA. 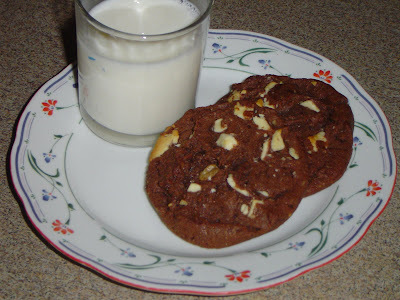 I came across these Brownie Cookies. Soft cookies with walnuts and chunks of white chocolate in them. Sooooo good. And with a cold glass of milk I was in heaven. I made DB hide the other two from me so I wouldn't eat them too!